(Phys.org) —Researchers at Penn State have demonstrated an acoustofluidic pump powered by a piezoelectric transducer about the size of a quarter. This reliable, inexpensive, programmable pump is a crucial feature for lab-on-a-chip devices that could make the diagnosis of many global life-threatening diseases easy and affordable. "The field of microfluidics and lab-on-a-chip technologies has the potential to revolutionize the healthcare industry with cost-effective, high-performance miniature biomedical diagnostic devices. Despite its tremendous potential, the field has only delivered very limited numbers of products and tools for real-world applications. One of the reasons is that it is difficult to fabricate micropumps that are simple and inexpensive, yet reliable and effective," said Tony Huang, professor of engineering science and mechanics in Penn State's College of Engineering. Huang and his team demonstrated that with a smart microfluidic design, low-power acoustic waves could deliver fluids precisely and reliably. The permanent equipment for the total lab-on-a-chip system, including off-the-shelf electronics, could cost as little as $20-$30 to make, and the disposable chip could cost as little as 10 cents, Huang said. Although slightly more expensive than paper-based diagnostics—such as home pregnancy tests—the system is far more versatile and precise, enabling quantitative analysis of, for example, HIV, hepatitis, cancer, infectious diseases, cardiovascular diseases, and nutritional deficiency. In the U.S., where many diagnostic tests can cost as much as $800 due to the high cost of equipment and the necessity for trained technicians, a cheap, easy-to-use, and yet high-performance device with a disposable chip that only costs a few cents could dramatically lower the cost of healthcare. In the future, a battery powered system could bring affordable disease diagnosis to regions without available electricity. "As engineers, we feel it is our responsibility to come up with innovative solutions and help provide better yet cheaper healthcare solutions. I foresee a time when these tests could be done in a doctor's office, at home, or in the field," Huang said. 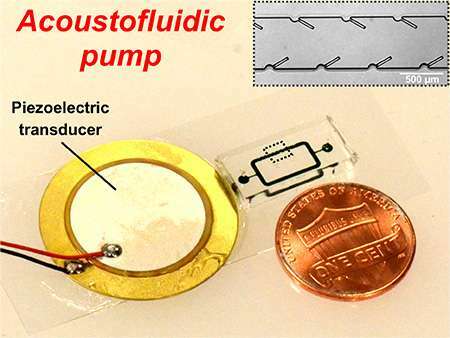 The pump works by oscillating a series of thin sharp-edge structures hundreds of micrometers in length that have been constructed onto the sidewall of a microfluidic channel made of PDMS, a widely used polymer. A miniaturized piezoelectric transducer, similar to the kind used in medical ultrasound, is the source of the oscillations. In the present work, reported online in the journal Lab on a Chip on September 4, 2014, a silicon mold of the device and the sharp-edged structures on its sidewall were first created using a deep silicon etch tool in the Penn State Nanofabrication Laboratory, followed by PDMS casting of the device. In the future, Huang said, the devices and chips could be created using standard automated machine tools controlled by computers (CNC) for scalable manufacturing. "Our pump is quite unique," said Huang. "It's reliable and programmable, with a minimum of hardware, yet highly precise. The flow rates can be tuned across a wide range, from nanoliters per minute to microliters per minute. I don't see anything out there with our characteristics." This video shows the real time pumping behavior under different input voltages of piezoelectric transducer. This video shows the pulsed pumping flow when alternately switching the piezoelectric transducer ON and OFF.